I have been watching the rest of North America and Europe suffering through a terrible winter. Endless snow, ice storms, floods, wind storms and power outages. Polar Vortexes (formerly known as a blast of Canadian Arctic air) and Snowmageddon and other colourful descriptions of what some call " formerly, a normal winter". I have very much appreciated the more moderating influence of the Pacific Ocean and the occassional warm air flow up from southern regions, usually California or the "Pineapple Express" from Hawaii. We have buds forming on trees, the hellebore was sprouting and the snowdrops are up. Or, they were.... they had better live up to their name as they are well and truly buried now! In fact we have had snow falling for over three days and nights. Its not the light airy stuff but heavy and wet. Its collapsing hedges, trees and plants. Bruce has been out three times using a rake to get the poor things unnburdened and no doubt will have to go out again tomorrow. We haven't been out anywhere and so no tire tracks in the drive way. We had a young friend call today to see if we are okay! That's comforting that someone thought of us senior "shut-in's". There were wind storms last week and we dutifully prepared with candles, extra water and provisions. Nothing happened. But with silent and never ending snow, the power outages sneak up on you and we sat in the dark and chilly house at 8 pm on a Saturday night and decided we might as well go to bed. The power came back on at 4 am and all the lights you had on, came back on. Bruce stayed up to watch the Canadians win the gold medal for men's hockey. I reckoned the hilights on the news would be enough for me and went back to bed. These were taken the first day and the snow is now up to the top of her long legs and she's pushing through it with her chest. She throws the ball into the air and then shoves her face into the snow drift and tunnels to find it again. There is much running to and fro and general goofiness that Airedales are know for. When she's done, she packs her ball to the back door and waits. Then the snow ball removal begins! Snow days means prime weaving weather so I have been working on getting the big loom all set up with a 8/2 cotton short towel warp. Its a multi striped coloured warp that changes every eight ends, with a black every third stripe for continuity and contrast. The colours are chosen from many cones that are down to their last third or less and I was able to recycle several tube centres into the recycle bag. It was a spontaneous selection of colours. Pick a pair that go together nicely and the third stripe was black. The only organisation was I placed the pair of colours on the far right and when the top of the table was full, then I went back to the original pair and then split them up or, at least, reversed the colour order. (the cones waiting south of the bobbin winder are wall flowers waiting to dance .... they may or may not﻿). I would wind on each one inch bout as I went. Twenty four in all; seven yards long. I hung the lease sticks from the upper castle and threading started. It made for a bright collection! It was a straight draw of one through to eight and the sett is 24 epi. So this warp will take time to weave off as its for a half dozen towels, plus the last towel will be left for the possible new owner of the loom to try their hand at throwing a shuttle. I did promise you a peak at the pattern as it will be a long time before you see the finished towels! 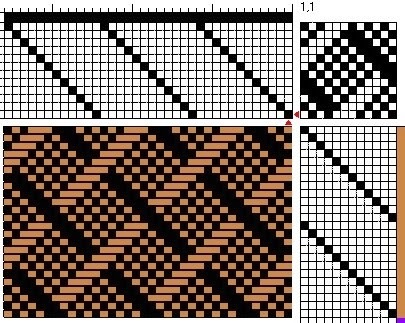 The pattern is Breaks and Recesses from Carol Strickler's 8 Shaft Pattern Book. 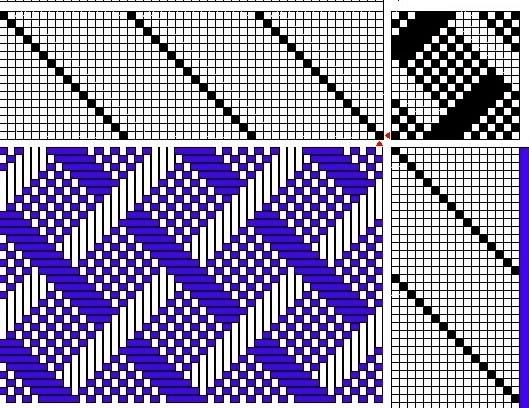 I have done this pattern before here and here and here. I love the way it produces tidy little boxes of twill that will make a nice thirsty and colourful towel. No long floats and an easy threading and treadling. I'll post update pictures of the progress from time to time. First towel is an all black weft for now. Now to see if we can get out of our driveway and get to town for groceries and a post office visit. We are getting cabin fever after four or five days of togetherness! Parting shot: our back deck late last night.... and yes, it was still snowing. Quite some ago I found a draft I really liked from a Weaver's magazine issue 44, Summer 1999 and playing with it on Fiberworks, I adjusted it from sixteen shafts down to twelve shafts. I wound up a warp for this project and it was originally slated to go on the Louet Spring, with its smooth warp beam. 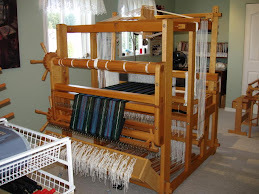 It was hung up on the side of my big loom where I store future warps so they are handy to go on as soon as a loom is empty. Then stuff got in the way... time passed. Then, I got caught up in the hurry to get shawls ready for the Christmas sales and then there was that runner commission to do as well. I decided to switch that lattice project to the big Woolhouse loom and take advantage of the 20+ tie up assist to do the daunting 144 cord tie up﻿. So I took the sectional rakes off, and dusted off the raddle, and beamed the warp up. It was a taupe 8/2 tencel, with a sett of twenty four ends per inch and it went quite well. It was a straight draw of one to twelve for threading and the same again for treadling. All the pattern is in the tie up. The drape on this one is beautiful and light! The selvedges were quite nice but there was a slight pull in at the little border after wet finishing. It was perfect until I washed it, so I think this is due in part to the change in pattern plus the shrinkage of the silk. Its more balanced between plain weave and twill in the section above and so doesn't pull in. Its not a big problem and the close up picture exaggerates the change. This time the border didn't pull in. I believe the tencel weft has more 'presense' in the cloth and held its own. (The silk was finer and perhaps compressed too) So each is unique despite being woven up identically, treadle wise. The only annoying problem between the two scarves was the right hand floating selvedge frayed and broke every 6 to 10 inches. No matter what I did, changed or shifted. Oh, well... it was consistent the entire way! The Woolhouse is being prepped for a seven yard "one of a kind" coloured striped kitchen towels. This is where I'm using up small bits of 8/2 cotton cones. Once loaded, I'll weave when I can and putter along.... so no holding your breath for the finished towels! I will show you the warp once its under way. I'm weaving eight shaft "breaks and recesses"...one of my favourite stand by's, which I haven't done in awhile. On the Louet Spring, I have a silk shawl project and I'll save the details for another post but my weft yarn has arrived. This is a silk yak blend and this is the natural colour when you blend bombyx silk and the yak beige brown. Its the equivalent of 30/2 so quite fine. My original stash of this soft yarn has finally twindled down to nubs and it was time to spend some of my Christmas sale money and reorder. Treenway Silks used to be just off the coast from me on Saltspring Island but now is being operated from Lakewood, Colorado. My order took a bit longer to reach me as a result but I'm thrilled with the yarn. Beautiful quality and I really like their paper skein wraps. It lists size, yardage, weaving setts and more. Very helpful information! There's my little family, Bruce and Calli working on a project in the laundry room together. I couldn't resist this shot... She's ready to lend a hand paw anytime! There is a toy or ball just out of the shot in case he changes his mind about working. She's just as helpful with my looms and stuffs toys under the treadles.